It isn’t midnight yet ...The French Compagnie XY explores the limits of what is physically possible, turns bodies into poetry, together creating magical moments. 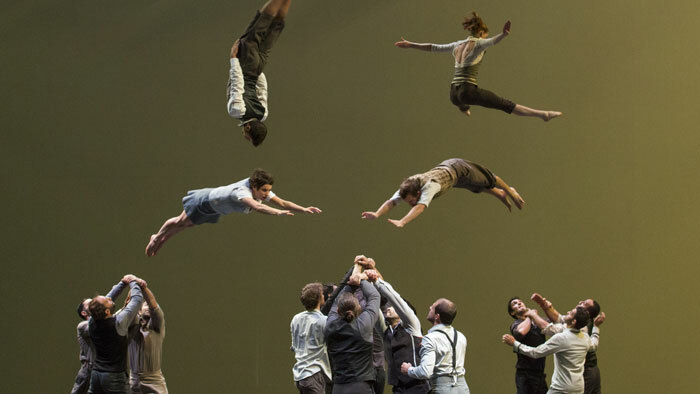 When the 22 acrobats get to open La Strada at Graz Opera House, they will illustrate that great acrobatics don’t require spectacular stage scenery. With their bodies they masterfully create entire landscapes, delighting in the game of building and dismantling, composing and falling apart. A powerful visual masterpiece of circus art and dance. For La Strada events at the Graz Opera, there is no discount on parking tickets. Collective : Abdeliazide Senhadji, Amaia Valle, Andres Somoza, Airelle Caen, Alice Noel, Ann-Katrin Jornot, Antoine Thirion, Aurore Liotard, Charlie Vergnaud, David Badia Hernandez, David Coll Povedano, Denis Dulon, Evertjan Mercier, Guillaume Sendron, Gwendal Beylier, Jérôme Hugo, Mohamed Bouseta, Romain Guimard, Thomas Samacoïts, Thibaut Berthias, Xavier Lavabre, Zinzi Oegema.